What does put first things first mean? I guess the first thing to figure out is what is a “first thing”. This is Steven R. Covey’s book the 7 habits of highly effective people and he is referring to what we would call important things. obviously, it depends on what your values are and what tasks are at hand. It also means to do important tasks before urgent tasks. If you’ve read the book, you’ll probably remember the quadrants that he describes with the axis’s of important or urgent. 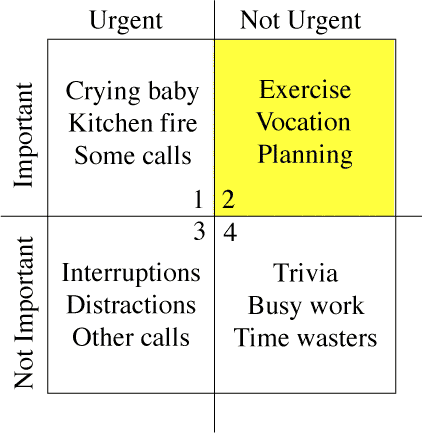 When we look at tasks organized that way, it’s pretty obvious that we should try to avoid activities in quadrant 4 but what may not be immediately obvious is that we should try to focus on activities in #2 (other than the highlighted color). Those are activities that are “first” – things that have the highest likelihood to impact your future. This is what put first things first means – put the activities that impact your future in a positive way first, before any other activities. It’s not always easy and actually usually pretty hard to do. For me, It’s about being able to identify what it is you are doing now that could be done later or that is not really essential to your goals. For example, I do love to watch movies and relax every night and even though that helps in my sanity so that I don’t feel like I’m always working, I do try to avoid it since I know it won’t really impact my future. How about you? How do you put first things first? Comment below so we can get to know each other.